Nadeem is the Acting Program Manager at AWP. He has over twenty years’ experience in natural resource management with the last twelve years working in various aspects of water resource management. He recently undertook a five month water policy specialist role through AWP, embedded with the Mekong River Commission’s Planning Division. Prior to that he worked in several water reform functions with the Murray–Darling Basin Authority including undertaking social and economic assessments, managing MDBA’s strategic research portfolios and overseeing environmental water needs assessments for the Barwon and Darling Rivers. He has also worked in project management and knowledge management functions with Land and Water Australia on environmental flow and riparian research programs. 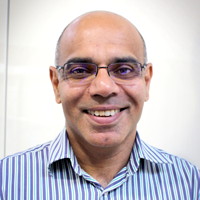 Nadeem has a Bachelor of Business in Agriculture (Curtin University), a Master of Science in Natural Resource Management (UWA) and is currently undertaking a part-time PhD in strategic environmental policy design at the Australian National University. The Australian Water Partnership is supported by the Australian Government. eWater is the AWP implementing partner.